The Synchronization pane can be accessed under the Tools tab in Motive. The OptiTrack motion capture system can synchronize with other external devices for various applications. The synchronization hubs, the OptiHub and the eSync, connect external devices through BNC cables, and sync signal patterns can be configured in Motive. Commonly integrated devices include video genlock, timecode generators, force plates, and actuators. Motive offers flexible synchronization configurations to match various external signals with unique characteristics. The mocap system can be set as either a master or a slave in the sync chain to either receive input signals or send output signals, or both. With such adaptability, the sync configurations may vary depending on which devices and signals are integrated. A basic understanding of signal processing is necessary in order to properly setup the sync chain. This page covers multiple features and settings available in the Synchronization Pane. The synchronization mode can be selected from the drop-down menu at the top of the Synchronization pane, which can be found under the Tools tab in Motive. Available synchronization modes are Free Run Synchronization, Custom Synchronization, and 3D Glasses Synchronization. The Apply button configures the OptiHub or the eSync to use the settings defined in the synchronization pane. 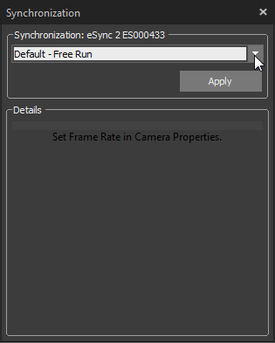 Default-Free Run: Free Run synchronization mode uses the default sync settings and sampling rates defined in Devices pane. The synchronization hub, either the OptiHub or the eSync, is considered as the master in the camera synchronization chain and the default settings are applied. Custom Synchronization: Custom synchronization mode allows users to explicitly set the sync settings. Available options are different for syncing through the OptiHub and the eSync. Each setting is explained in later sections. 3D Glasses Synchronization: This synchronization mode is used for synchronizing common 3D glasses. Using this mode, the camera IR strobes are timed not to interfere with the IR emitter from 3D glasses. The custom synchronization mode allows configuring both synchronization input and output signals as well as the triggering patterns. Depending on which type of system and what type of synchronization hub, the OptiHub or the eSync, is used, the available customization options are slightly different. Please refer to the following pages for more details. This page was last modified on 31 January 2017, at 14:05.